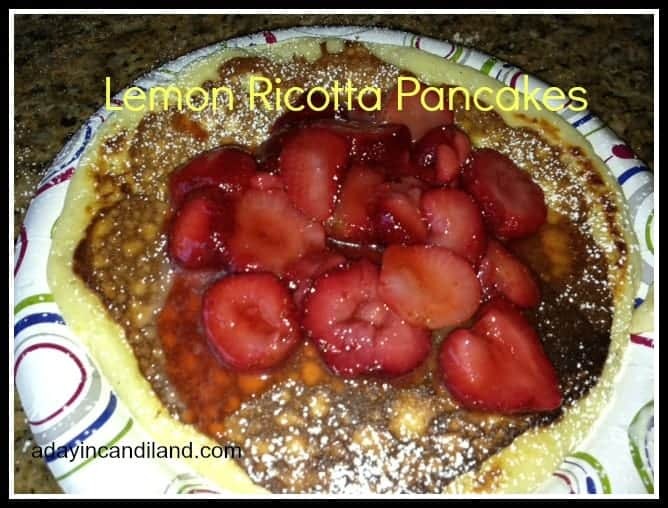 If you love lemon you will love these Lemon Ricotta Pancakes! Have you ever been to a restaurant for dinner and started looking at the breakfast menu? We were at Cheesecake Factory and if you have ever been there you know how big the menu is and not only lunch and dinner items but breakfast too. As I was looking at the menu, something lemony and cheesy stood out and after reading the description, I had to call over the waitress and ask her about it. Lemon Ricotta Pancakes. I love anything with lemon in it and I will try to make anything that has it in it too. We went home and I found a recipe to make it. I went to the store and got all the ingredients and I made the batter and hubby made the pancakes. Now I love pancakes and all breakfast food, it’s really my favorite meal of the day. I was so excited to eat it and it tasted delicious. My kids even ate it knowing there was cheese in it, made it questionable to them, but it was a hit. We added strawberries, but blueberries would have been just as good. This recipe is great with strawberries or blueberries on top. It is not too sweet so the addition of the berries works well. This recipe was adapted from the Cheesecake Factory. Place the flour, baking powder and salt into a mixing bowl. Stir the ingredients together until combined. Set aside. Add the ricotta cheese, sugar and lemon zest into the bowl with the buttermilk. Using a whisk. gently still the ingredients together. Heat 1/4 tsp of vegetable oil on a griddle or in a large non stick pan. Ladle the batter on the griddle until the pancake is nice and golden on each side. This recipe is enough to feed 3-4 people. 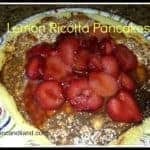 I hope you will try these pancakes and see if you enjoy the lemon goodness as much as I do. Sign up for my weekly email recipes at the top of this post. Thanks for visiting and leave me a comment below. This looks delicious! On a scale from 1 to 10 (1 being easy), how difficult is it to make this? Excellent idea, I think I am going to make one large one for my girl birthday. I hope she likt it! !